Matt Chandler has made some major decisions over the past year, including a plan to return full-time to his family’s farm in Fillmore, IN. Although Matt was raised on the farm, worked there as he grew up and continued to work on the farm part-time, he hadn’t made a full commitment to operate the farm on his own. This spring, Matt will take over as the fourth generation to operate the 52-acre family farm, along with 10 acres he owns. When interest in U-pick strawberries declined in the early 2000s, the family stopped growing strawberries. “Then we were hounded by people who wanted strawberries, so four years ago I put strawberries back on the farm,” said Matt. “We put in about an acre and a half.” Dry conditions in 2017 resulted in crop failure, but this past spring, the Chandlers planted two acres of strawberries under plastic. Today, the family is in the process of transitioning from the old, original trees to newer varieties. “We’re trying to maintain some of our heritage with the heirloom varieties, but we’re also updating the orchard and growing practices,” said Matt. “We’ve gone from about 300 bushels an acre from some of the older trees to the newer dwarfing rootstock. We planted our first tall spindle orchard this year, and the trees are four feet apart on dwarfing rootstock.” He said the long-term yield goal is 1,000 bushels/acre. Rootstock includes Bud 9, G.935 and Nic 29. “Honeycrisp are difficult to raise on Bud 9,” said Matt. “I’ve heard some growers have had better luck with other G and Nic series for Honeycrisp.” Now, the orchard includes 300 Honeycrisp trees, but the next planting will be on different rootstock. Matt has found managing Honeycrisp carefully, including thinning, helps prevent alternate year bearing. As Matt returns to the farm full-time and moves the operation to the point of supporting his family, he has some changes in mind. “I’m trying to bring my business degree into this and aiming higher than break even,” he said, adding his dad is open to changes. 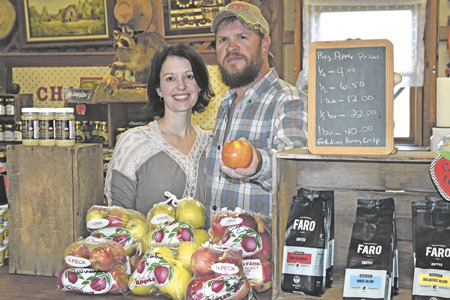 “We have some more solid plans for the agritourism aspect and some changes in how we did things in the past.” The family has always hosted school tours and hay rides, and now that those activities are categorized as agritourism, Matt will continue to make appropriate changes. “We don’t want to feel like we’re taking advantage of people, but at the same time, people have to realize how much time and effort goes into planting and maintaining a corn maze,” said Matt. 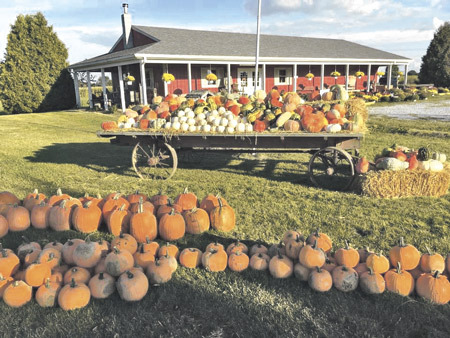 “We grew sunflowers last year, and we’re going to do that again this year.” Matt hoped the eye-catching flowers would draw customers in August, just prior to apple season. Although the sunflowers drew attention, they didn’t sell well. Visit Chandler’s Farm and Country Market online at www.chandlersfarmmarket.com.